be applied to almost any chart and in any time frame. As with almost all other types technical analysis, this trend trading strategy can be used at whichever degree of time frame the analyst trades whether that is for intra day trading strategies, swing trading or for long term investing. The main risk with the longer term time frames is that it is possible that prices could gap down through our stop levels. This would only really occur after the market had been closed for the weekend or a holiday. Price can gap in real time trading in fast moving financial markets but this is most likely to be in the direction of the trend that we are following anyway. Either way, it is essential to protect yourself as much as possible from these occurrences and if your broker has a facility to offer guaranteed stops, the marginal extra cost may well be worth it. To conclude this Technical Analysis of Stock Trends article, and now that we have a change in trend completing this example of a trend trading campaign, lets put things into perspective and take a closer look at the numbers. For this example, we will assume a very conservative approach by calculating using the value for entering a trade only at the break of the previous highs, rather than the break out from the consolidation patterns - apart from B8 where it did not quite break, and we have calculated using the more aggressive entry at the consolidation breakout. You can see from the table that the maximum risk was taken at the initial phase and even then, this was limited to a maximum loss of 20 sp500 points, even with holding two trades. There was any number of ways to trade this particular trend example. 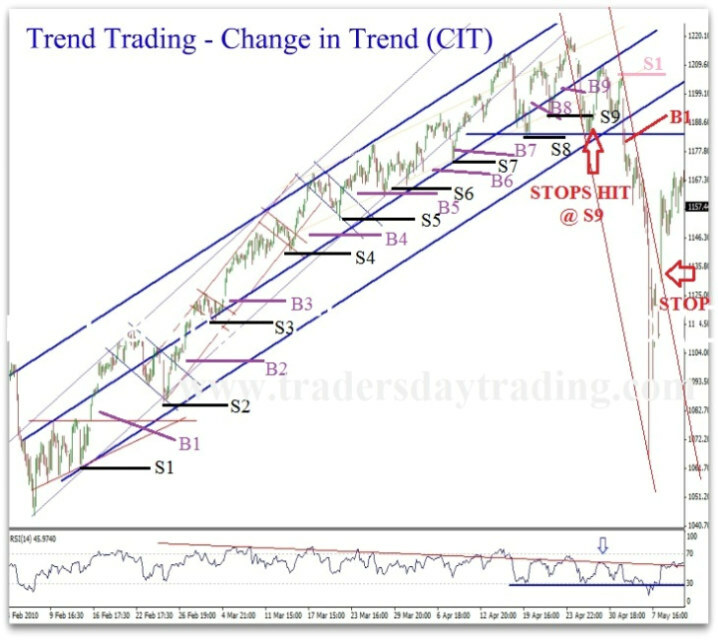 We suggested in part1of this technical analysis of stock trends article that a conservative trader may only enter and run the first B1-B2 trades and you will see from the table that would have netted 110-200 points respectively. We could have chosen any combination of these entry points to enter a trade ie B1, B3 and B5 or another super conservative strategy would have seen B2 as the first entry point where the market would have broken up and back tested the break before breaking out upwards again. Day traders can use this trend trading strategy for day trading and may enter a trade at each or anyone of these entry points but instead of waiting to get stopped out, a day trader will take the profits on each short term trade. The key factor is that which ever entry strategy is used, the trailing stops strategy must be implemented as described.